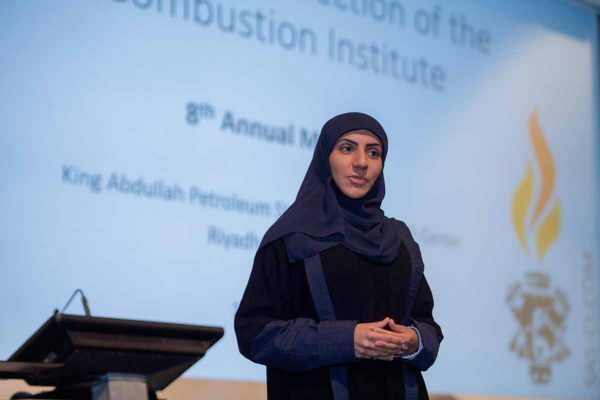 The eighth Annual Meeting of the Saudi Arabian Section of Combustion Institute was held from 1 to 2 May at King Abdullah Petroleum Studies and Research Center (KAPSARC) in Riyadh. The event brought together more than 100 experts from institutions in Saudi Arabia, the UAE, Oman, and the U.S. 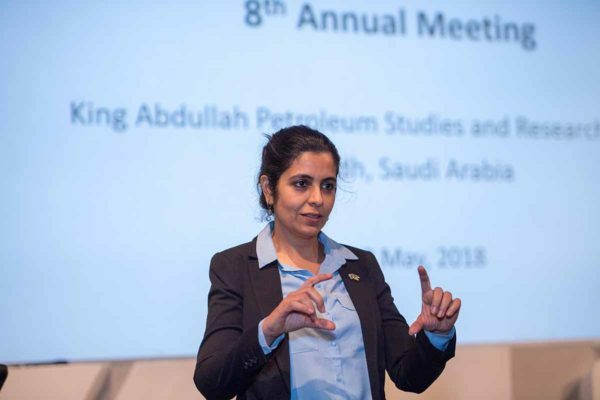 The theme of the meeting was “Clean and Efficient Utilization of Fuels for a Sustainable Future.” The meeting was jointly organized between KAPSARC, Saudi Aramco and King Abdullah University of Science and Technology (KAUST). 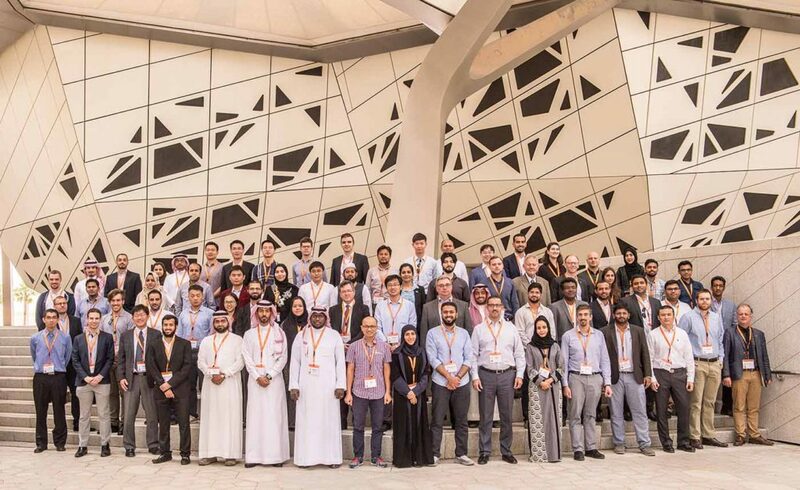 Some of the more than 100 experts from institutions in Saudi Arabia, the UAE, Oman, and the U.S. pose for a photo following the meeting of the Saudi Arabian Section of the Combustion Institute at the King Abdullah Petroleum Studies and Research Center in Riyadh. 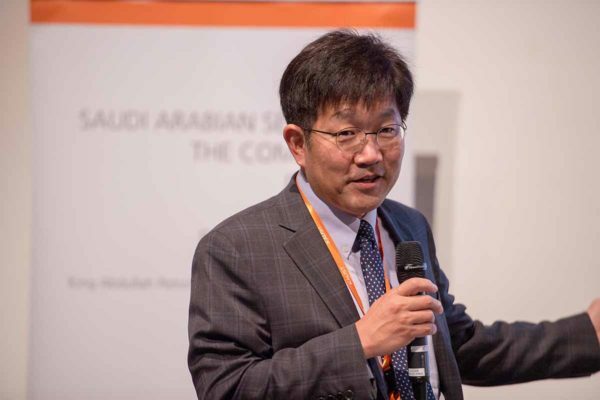 Hong Im, Professor at King Abdullah University of Science and Technology, and SAS-CI Chairman, welcomes participants to the eighth annual meeting. 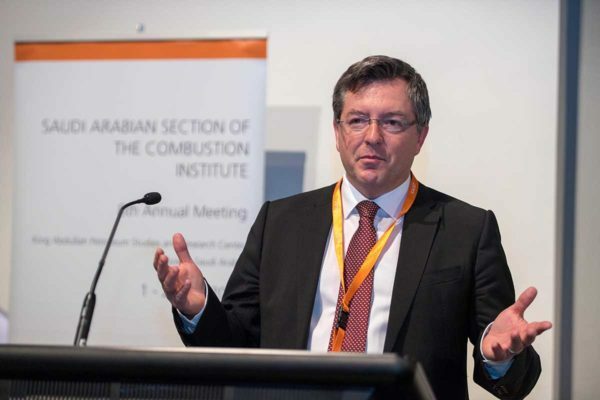 The growing global demands for energy and environmental sustainability pose tremendous challenges and opportunities for the combustion research community. “There is no one-fit-for-all solution to address these challenges,” said Hong Im, Professor at King Abdullah University of Science and Technology, and Chairman of the Saudi Arabian section. Instead, synergistic integration of conventional and emerging technologies, including renewables, will be essential in delivering solutions which are both environmentally and socially sustainable. “I am proud to be part of the many world class researchers in the Kingdom who will lead these efforts,” said Im. 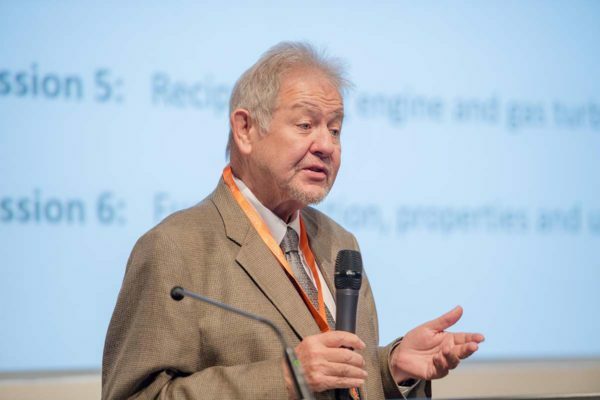 Sustainability was the recurring theme in the three invited lectures at this year’s meeting. Sylvain Cote, Program Director for Energy Demand, Efficiency & Productivity at KAPSARC, discussed the challenges and opportunities associated with the transition to renewable energy in the Kingdom. Among these, Cote highlighted the need for targeted policy action by government to help alleviate an anticipated skills gap. “Although the emerging renewable energy sector is expected to provide new jobs, it is equally important to recognize the limitation and reflect on the adjustment and reform efforts needed. If not, the current labor mismatch could represent a lost opportunity for the upcoming young Saudi population” said Cote. Dr. Anvita Arora, Program Director for Transport & Urban Infrastructure at KAPSARC, discussed strategies for environmentally and socially sustainable urban transport systems. “Our research is closely aligned with the Kingdom’s Vision 2030 and the National Transportation Strategy, which seek to reduce domestic dependence on oil, while creating smart and sustainable cities throughout the Kingdom,” said Arora. The eighth annual meeting was held over two days. In total, 49 presentations were made across the six different technical sessions. In addition to the technical sessions, the meeting featured a work-in-progress poster presentation session. Recently appointed KAPSARC President, Adam Sieminski, provided the opening remarks at the meeting. 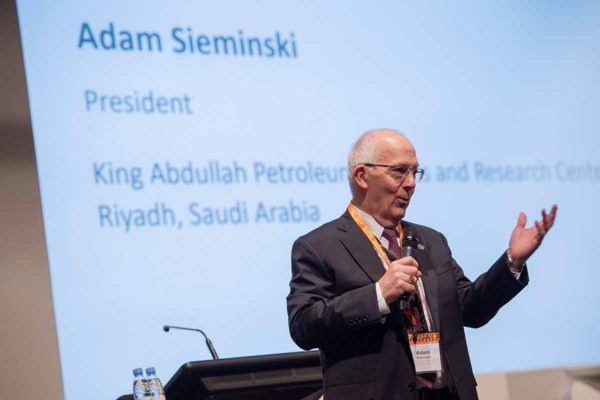 Adam Sieminski, President of King Abdullah Petroleum Studies and Research Center, provides the opening remarks at the eighth annual meeting. 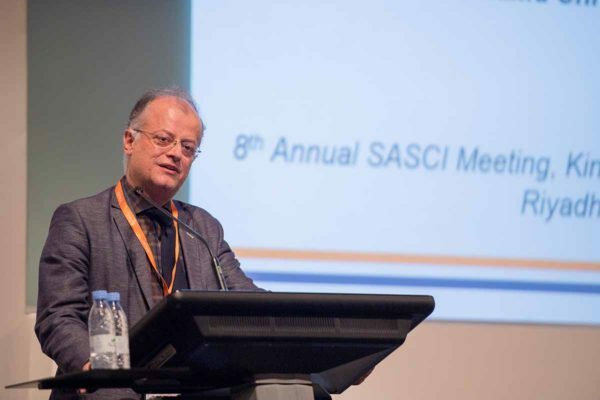 Robert Dibble, Professor at King Abdullah University of Science and Technology, and Master of ceremonies, addresses participants at the eighth annual meeting. 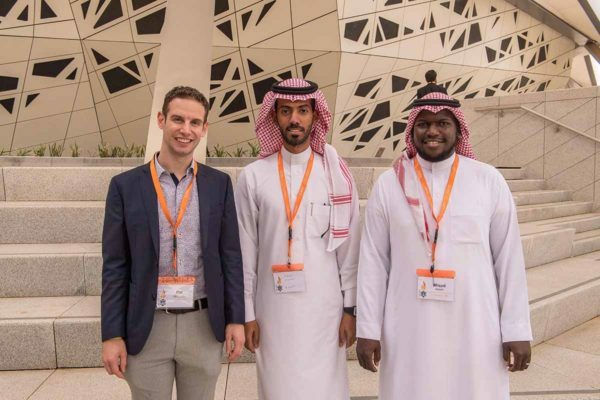 Saudi Aramco R&DC scientist Kai Morganti, with Ibrahim Alshunaifi and Hisham Alharkan from King Abdulaziz City for Science and Technology.